When you begin your search for that perfect diamond, you'll discover that there is a vast difference in price, and the price is typically based on the four Cs of judging diamond quality, including cut, clarity, color, and carat. Before you make a diamond purchase, you need to familiarize yourself with these terms, and you also need to find a reputable jeweler. While you can examine diamonds yourself, you can guarantee that you are getting value for the price only if you rely on the expertise of a diamond specialist. 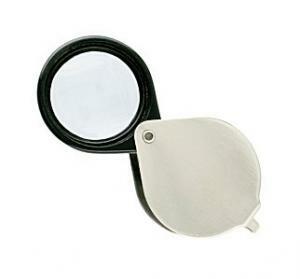 A loupe is a type of magnifying glass that is commonly used by jewelers when they are judging diamond quality and examining stones for flaws and inclusions. You can expect some imperfections because flawless diamonds are rare and very expensive. Inclusions may include pinpoint, cleavage, laser lines, growth lines, grain lines, bearding, and feathers. 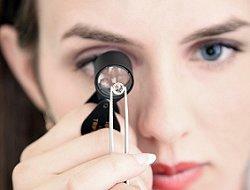 A reputable jeweler will be happy to let you view your engagement ring with their loupe. Have you ever noticed a gorgeous diamond which catches the light and sends sparks radiating around the room? Chances are this diamond had an excellent cut. The cut of a diamond actually refers to how many well-proportioned facets are in the stone. A good cut will allow the diamond to sparkle. The cut also refers to diamond's shape, such as pear, emerald, oval, or round. I1, I2, I3-These diamonds have flaws which can be seen with the naked eye. SI1, SI2, SI3-These diamonds have small inclusions. VS1, VS2-These diamonds have very small inclusions. VVS1, VVS2-These diamonds have very, very small inclusions. Internally Flawless-These diamonds may have very minor blemishes on the outside of the stone. Flawless-These diamonds do not have any inclusions and are considered to be perfect. When rating the color of a diamond, jewelers commonly use the letters D through Z. The more yellow or brown tint a diamond has, the less value it receives. The rating D represents a diamond that is colorless; while the rating Z has a yellow or light brown hue. Carats refer to the size of the diamond. Each carat has one hundred points. The carat weight refers to the mass of a diamond. Larger diamonds will certainly cost more, but you will still need to factor in cut, clarity, and color to discover a diamond's true value. It is important that you ask your jeweler if the diamond you are interested in has been treated. Treated diamonds have been painted or had fillers made of glass inserted to make the diamond appear clearer. You should ask for a certificate stating that the diamond hasn't been treated. There are many different factors to consider when judging diamond quality. The best judge of a stone's value, however, is whether or not it suits the bride-to-be's style and the couple's budget, as well as whether or not it symbolizes the depth of their relationship.